hey, welcome to my new website! i’ll be trying to update this blog with current project shots, new projects i’m starting, and sometimes just cool design stuff that is worth sharing. my first “share” is unashamed self promotion. 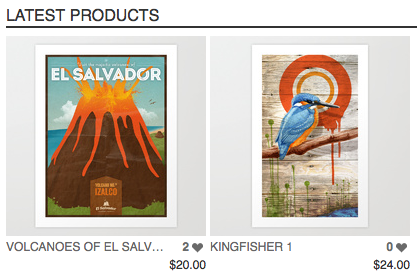 i’ve got my El Salvador volcano poster and a Kingfisher art print available for sale over at Society6.com. get yourself some new art!